The first question arises is “Why India is so concerned about some internal political problem in ‘Sovereign’ Nepal?” The main reason for this concern is the level of connection Indian feel with Nepalese. India is not only economically but also socially – culturally natural ally of Nepal. When this year 8.6 magnitude earthquakes struck Nepal-India extended helping hand and committed herself for long-term post-disaster rehabilitation of Nepal. While other countries were working on their strategy to help disaster-stricken Nepal, at that time not only central government but also state governments of U.P, Bihar & West Bengal reached out to Nepalese brother and sister. Nepal enjoys special status in India's foreign policies. If India and Nepal are such natural allies then how do these two countries reached such a point where the political representative of Nepal questioning India’s intention in United Nation General Assembly. So let’s review the Nepal crisis. The main problem lies in the demographic distribution of the Nepal population. 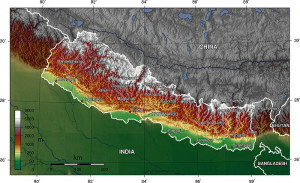 According to one survey, more than 50% of Nepal’s population lives in Madesh Plain. Even though in majority Madhesi were discriminated for centuries. They are discriminated on the basis of their culture language complexion etc. khas Arya historically consider Madhesi as non-Nepalese and treat them as second class citizens. To legitimize their discrimination, Khas Arya calls Madhesi as ‘Indians’ and blame India for anything going wrong with Nepal. The main points that have caused chaos in the otherwise silent small hilly country. The Madhesi who comprise more than 50% of Nepal’s population has only 65 parliamentary seats out of 165 total seats. Earlier proportional representation was discussed but later completed rejected in the final constitution which has earned irk from the Madhesi. Madhesi and Janjati who are at loss boycotted the constitutional assembly due to this reason. Originally in Interim constitution it was decided that there will be 14 provincial states but in the final constitution they demarcated 6 provinces and later added one more. So only 7 provinces as opposite to 14 promised earlier. Many Madhesi is unhappy due to this demarcation because such division will ensure Madhesi minority in most provinces. The religion of the state. As the majority of the population is Hindu most of the population thought Hinduism would be the logical religion of the state. Most of the right wing Madhesi wanted Hinduism as the religion of state as against secularism declared in the constitution. The reason for such a standoff is insensitivity shown by both parties. Insensitivity from Nepal’s part is being indifferent to Madhesi and India’s concern. Bihar is going for election so it wants its border to be peaceful at least during election time. But Nepal did not pay any attention to those plans. Insensitivity from India’s part is by calling Nepal’s ambassador and sending its special envoy. Nepal took this as the threat to their sovereignty and expressed its concern in UN general assembly. So answering the question asked at the beginning, “Why is India concerned?” With Pakistan, China and Sri Lanka not in good terms with India, it is difficult for India to have one more hostile neighbor. Stable and peaceful Nepal is among the top priority on India’s foreign policy. Unstable Nepal would invite larger China interference of china in the Indian subcontinent which would tense India-China relation. With 50 million Nepalese in India and 2 million Indian in Nepal and long open border violence in Nepal means volatile U.P, Bihar and West Bengal. Indian foreign policies must be consistent.The lesson for India is to avoid another Sri Lanka like the debacle in Nepal.